My review copy: A copy was provided by the publisher in exchange for an honest review. Slender wisps of hair stick to this young man's temples, water darkens his heavy eyebrows, and the corner of his mouth twitches as a long drop of rain slides like a scar down his chin. He's not handsome, but I think I could stare at him for a very long time. To pass time Unferth and I made the tower into an obstacle course and I ran it again and again while he graded me from the kitchen counter. My grades tended to be less about success and more about flare, as he awarded me with cries of "You look like a donkey!" or "There are those beautiful Valkyrie wings!" depending on how well I finessed a corner. I built a huge nest out of old sweaters and blankets near the ground-floor hearth, the only place warm enough that my voice didn't puff out in icy fog. We'd fall asleep side by side, though sometimes I stayed awake on purpose, just to listen to him breathe. But sometimes he would push me onto a stool to brush and braid my hair, or tease me with a string of riddles whose answers were always troll, and his hands would linger on my neck, his smile relaxed, and I'd have traitorous thoughts about staying in that tower with him forever. To my surprise he murmurs, "Isn't the heart of every relationship a riddle?" "I will not let you die, Valkyrie," he says. "I am not planning to die, berserker." Sharkman leans over me, around me, as if he can surround me from all sides. "I will do what I have to do." Soren tilts his head up, wincing away from the bright sky. "There's nothing Astrid could do to make me stop loving her." Relieved that he understands, I smile. "I'm sure Ned Unferth could manage something unforgivable if he tried hard enough." "Probably that's part of what makes you like in him. You both reach for impossible things." As he joins me on the bank, I lift my chin and adopt and air of haughtiness. "Naturally." After immersing myself into Tessa Gratton's imaginative world in The Lost Sun, I was looking forward to jumping into book two. I figured I'd be entertained and get lost in the beautiful writing. What actually ended up happening was way more than that. I ended up absolutely LOVING this book. I enjoyed the first book without a doubt, but this sequel just blew me away. The Strange Maid is told from the POV of a girl named Signy, and I am such a fan of this chick. She's strong, she's smart, and she had this pleasant confidence about her. She knew what was up. And I felt like I identified with her in a way. The world created in this series is so amazing, and I connected to it through Signy in a way that made it feel tangible to me. Then there's also the fact that Signy also carried some kickass skills around with her. She was definitely an admirable MC. Soren is in this one, too. He's another one of those friends Signy has which I adore. I was so happy to see him in this book, and to see his story entangle with hers. The Lost Sun was such a ride for him, and seeing him now, thorough someone else's eyes was fantastic. He's such a wonderful person, a protective and caring friend. I'd already liked him bunches from book one, but now I'm pretty sure I have a strong, legit crush on this guy. I heart me some Soren, y'all! Same as in the first book, the writing in this book was magical. I got pulled right back into this world as if I never left. Pairing that with the compelling voice of Signy, and this book had me on a reading binge for hours. I read this whole thing in one day because I just couldn't stop. I was so emotionally attached to this story and these characters, and I HAD to find out how it all turned out. Even more than I was with book one, I felt so invested in this novel, and I FEEL it in my heart and it's so beautiful. I don't even feel like beautiful is a strong enough word, but it'll have to do because I can't think of one better. Just...LOVE. Overall, I fell in love with The Strange Maid. With elegant writing that makes me believe in this alternate reality, and characters that make me feel and ache and love, Tessa Gratton has completely entranced me with this story, and this series. I can't wait for next summer when book three releases, because I will without a doubt be picking it up and, very likely, falling in love. 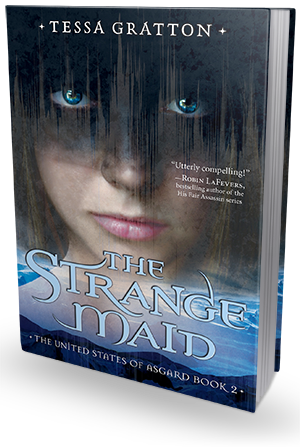 Random House is providing a copy of The Strange Maid to give away here on Bookish! 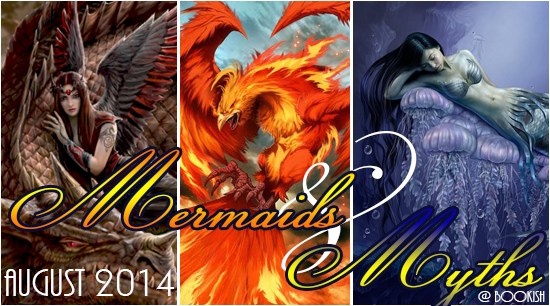 For more reviews, author features, discussion posts, and giveaways, click on the banner to see the full MERMAIDS & MYTHS schedule!